The Ancient Greek word Dia-logos meaning “through the word”, became the English word Dialogue. The Greeks viewed Dialogue as a free flowing of meaning through a group, allowing the group to discover insights they couldn’t individually. Rather than proving any person’s opinion was right or wrong, Dialogue sought to have a greater Whole of understanding emerge from a cooperative exchange of ideas among all parties. I was introduced to the term Contemplative Dialogue as part of the Bridges to Contemplative Living with Thomas Merton workshop which I have co-facilitated at the Spiritual Life Center in West Hartford, CT since 2013. Intrigued to learn more. I conducted further research and had discussions with the Contemplative Dialogue staff. This convinced me to take the 4-day Intensive Workshop entitled Mindful Leadership - The Path of Contemplative Dialogue in August 2013 in Bardstown, KY.
After participating in the workshop, I have been applying Contemplative Dialogue skills to the things I do in my life. My experience convinces me that this method increases relational effectiveness, personal awareness and leadership in a way that is consistent with my most deeply held values. Since the workshop, I have been engaged with Steve Wirth, the method's founder, on a monthly basis to better understand and incorporate Contemplative Dialogue into my life and work. Contemplative Dialogue (also known as Active Engagement in Business and Secular settings) is a framework of principles and practices founded on Spiritual, Psychological and Modern Organizational Learning Theory. It is has been taught and is being applied in a large variety of Business, Government and Faith-based organizations and by numerous practitioners around the world. The Spiritual foundation of Contemplative Dialogue is based on the fundamental belief that being human is more than just the sum total of the details of our daily lives. The distinctive element of human consciousness is that despite our finite limitations we have the ability to make choices that create the person we become. By being more aware, we are more open to act and make choices from our authentic (True) selves. When we act from that place of authentic self we also have the best chance of touching and eliciting actions and choices from the authentic self in others. Contemplative Noticing (Mindfulness) – What we do not notice, we cannot freely respond to or choose to engage. Developing a clear and humble awareness in order to take "a long, compassionate look at the real”, not only as I define it but also incorporating the realities of others and the overall situation permits better choice being made by all those involved. Nonviolent Engagement (Whole System Engagement) – At its highest level, Contemplative Dialogue develops a consistent ability to relate with and to the collective mind of a group. When we engage in this way we acknowledge that we are deeply interdependent and that any action which damages the common good is detrimental to all and so we have a greater commitment to integrity in our interactions. The Psychological foundation is simple and is based on the observations of modern psychology that 90% of our actions are unconscious. As Carl Jung, one of the founders of psychoanalysis has said - "our task is to make the unconscious, conscious." 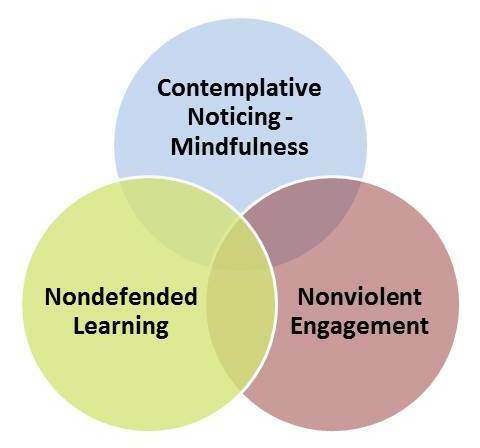 Contemplative Dialogue / Active Engagement seeks to bring awareness to our unconscious behaviors using tools and techniques from Modern Organizational Learning Theory. Please navigate each level of Awareness for a more comprehensive explanation of the Contemplative Dialogue tools and techniques most associated with that level. Finally there is a unique set of Process Values that set Contemplative Dialogue / Active Engagement apart from other contemporary approaches.